British and Greek archaeologists are preparing a major excavation on a tiny Greek island to try to explain why it produced history's largest collection of Cycladic flat-faced marble figurines. Artwork from barren Keros inspired such artists as Pablo Picasso and Henry Moore but also attracted ruthless looters. Now experts are seeking insight into the island's possible role as a major religious center of the enigmatic Cycladic civilization some 4,500 years ago. Excavations will run April through June. Keros is one of the riddles of prehistoric archaeology, said Peggy Sotirakopoulou, curator of the Cycladic collection at the Museum of Cycladic Art in Athens. Of the more than 1,400 Cycladic figurines that have survived, only 40 percent are of known origin, as looters destroyed all evidence on the rest. But more than half the documented artifacts are from Keros. What is particularly impressive is not just the bulk of the finds, which is larger than the total from the rest of the Cyclades, but also that they were intentionally broken during ancient times, Sotirakopoulou said. Therefore, this is a very important, a unique site. The Cycladic culture - a network of small, sometimes fortified farming and fishing settlements that traded with mainland Greece, Crete and Asia Minor - is best known for its elegant artwork: mostly naked, elongated figures with their arms folded under their chest. The seafaring civilization was eclipsed in the second millennium B.C. by Crete and Mycenaean Greece. Currently inhabited by a goatherd and his flock, Keros lies near the eastern rim of the Cyclades island chain - which includes the humming resorts of Mykonos and Santorini - between the larger islands of Naxos and Amorgos. 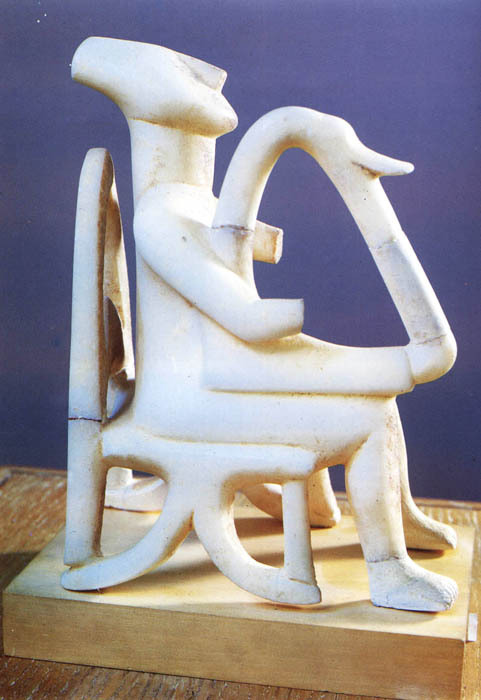 Keros was extensively pillaged during the 1950s and 1960s for its marble figurines, hundreds of which were illegally exported to fill museums and private collections in Europe, the United States, Australia and Japan. The prevailing explanation is that this was a sacred repository, a sort of pan-Cycladic sanctuary where people left objects within the framework of rituals which included their intentional smashing, said Sotirakopoulou. Past digs - legitimate or otherwise - were carried out on the islet of Dhaskalio, just off Keros, and the Kavos area opposite. This year's work will focus on virgin ground. We hope the forthcoming excavations will clarify further the nature of the occupation and activities at Dhaskalio and Kavos, Renfrew said. It is clear Kavos was an important site where high prestige artifacts were deliberately broken and left. It is possible, but not yet certain, these were ritual actions relating to ceremonies in honor of the dead. Experts agree that the elegant marble figurines were highly prized in the early bronze age Cyclades but still don't understand for what purpose they were made. The figurines have been variously interpreted as depicting gods or venerated ancestors, serving as replacements for human sacrifice - or children's toys. One thing is certain: They were not abstract works of art pared down to the barest representational essentials. Visitors say, 'Oh how pure, how white the figurines are,' Sotirakopoulou said. But in fact they had details_ hair, eyes, eyebrows, jewelry - painted on. In most cases, the paint has vanished.